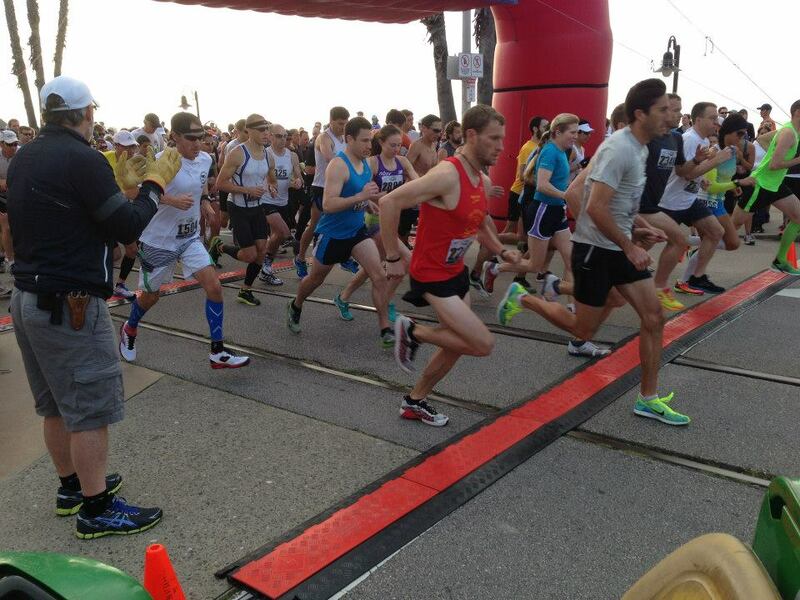 The start of the Santa Cruz Half-Marathon just before near disaster. One thing I’ve learned from running is that no matter how hard you work, a stupid thing like an untied shoe lace can bring months of hard training crashing to the ground. The flip side is sometimes everything just fits into place and you end up running much faster than you had any business doing. 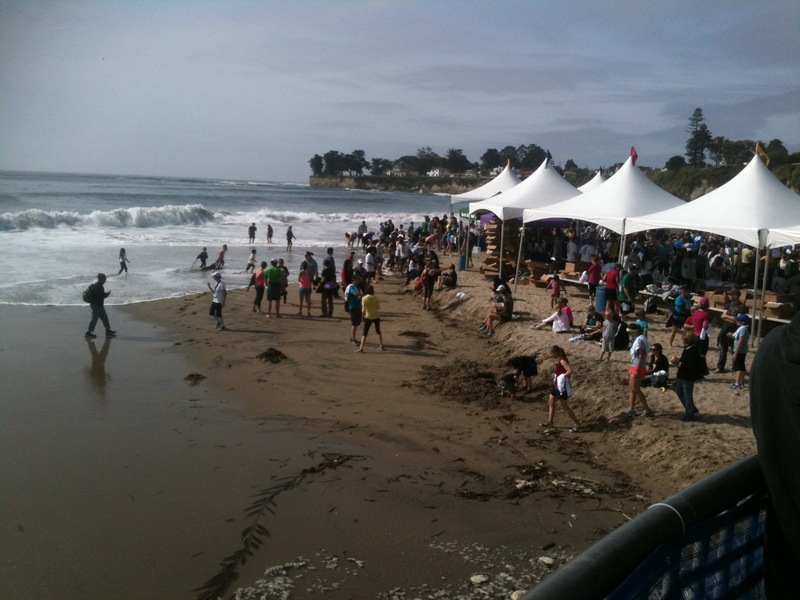 Such was the case in the Santa Cruz Half-Marathon last Sunday, as everything clicked on a gorgeous early spring Sunday. Not that things could’ve gone horribly wrong. When the starting gun fired, my car remote key entry tied into my shoe laces promptly broke off after I taking the first couple steps at the start. Some how, it got kicked to the side of the road and a spectator picked it up. Fighting back through the crowd like a single fish swimming against the rest of the school, I plowed my way back to the nice lady who picked it up, yelling “That’s my key!” and took it from her hand in a panic, without even thinking to thank her. Not the best way to start the race, but imagine the other possibilities. The remote could’ve got kicked into the middle of the pack where it would be harder to retrieve, or may have not noticed it missing until half way through the race. All things considered, I got pretty lucky with the whole episode. Working my way through the field, I tried to calm down and settle into a good opening pace. My plan for the early miles was to make sure no mile was faster than 6:45 pace, so of course, I come through the first mile in 6:35. Telling myself to slow down and relax, I come through mile 2 at 6:40 pace. 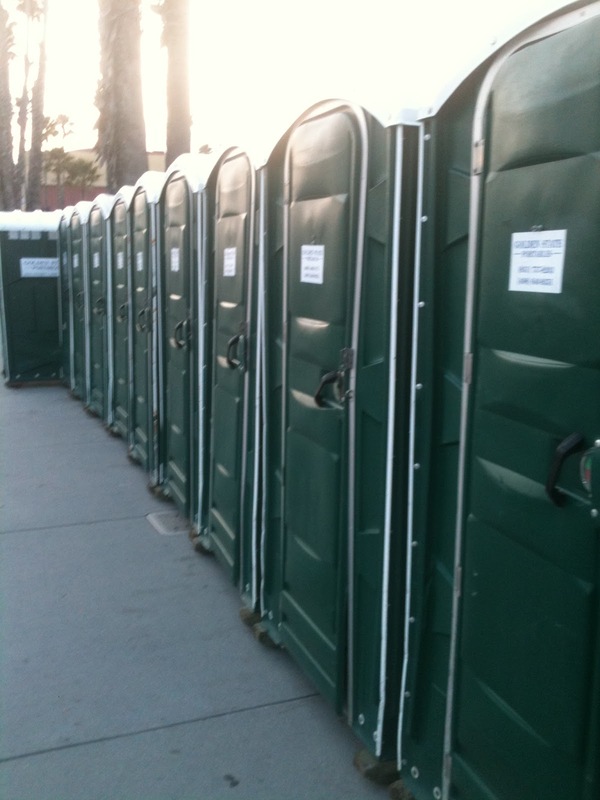 So much for my pre-race strategy. After five miles at 6:40-6:45 pace, I feared I would finally pay the price leaving the smooth asphalt for the uneven dirt and gravel trails of Wilder Ranch on the west edge of Santa Cruz, but I was still living a charmed life, running 6:45-6:31-6:46 for miles 6 through 8. There were plenty of great views from the trails as we ran along the cliffs high above the ocean, but I only snuck a few peeks. I’ve learned the hard way that taking too much scenery on uneven trails is a face plant waiting to happen. Exiting Wilder Ranch, the course heads back into Santa Cruz the same way we came. Coming through mile 9, I wasn’t too worried about clocking a 6:59 mile since this part of this mile consisted of a series of uphills, especially since I followed that up with a 6:50 on mile 10. But the hills and the optimistic pace began to really wear me down, and I started running out of gas from there, with the last couple miles a real struggle at 7:00 pace. Still, at 1:28:26, I averaged 6:45 pace, the upper end of my pre-race goal, despite chasing down my remote entry key which probably cost me at least 10-15 seconds. My training the last three months was plagued with a back injury in early February and a bad stomach flu in early March, each setting my training back about 10 days. I honestly thought breaking 1:30 for the half-marathon on the moderately challenging course would be difficult. How did I manage doing nearly two minutes better than that? Apparently, all those 6-12 mile tempo runs really helped, even though the fastest twelve mile tempo run clocked in a 7:09 pace. A couple eight mile tempo runs at 6:45-6:50 pace within six weeks of the Half-Marathon were probably good preparation as well, since I came through the first eight miles not too much faster than those training runs. I find long distance tempo runs help create the pace sense and mental discipline required to keep knocking out mile after mile at the same pace and for the first ten miles, so all those runs really paid off. There was another slight adjustment I made in my life which also seemed to help. I cut back on my beer consumption a bit the last couple months. Yes, beer is good, but each beer has a fair amount of calories and tots of calories aren’t good for running half-marathons. While I’m pretty happy with the performance, what held me back was that my longest runs, save for a 14 miler in January, were all 12 miles. At that distance, I simply wasn’t prepared to grind out the last 2-3 miles of a half-marathon. And my speed work was non-existent, consisting of a single workout of four half-mile intervals so I didn’t have the strength to handle the uphills of the ninth miles and hammer thelast four miles after that. So I’ll give myself a little pat on the back for a job well done, thank the running gods for looking favorably upon me that day, and just hope I haven’t blown too much running karma for not thanking that lady for picking up my key remote. I’ll take a couple days off, re-evaluate my training, and start going to work for the next race. I’m thinking of a 10k some time in May. Well done! Excellent effort. Sub 1:30 is brilliant. I'm yet to crack it. My best effort so far is about 1:31:20. I'm having 2 shots at half marathon distance this year, but will mostly be in a full marathon mind-set as I aim for my first full in October, so just going close to 1hr 30min will be a bonus. Thanks James! 1:31:20 is pretty close to 1:30 in my book. Good luck with your running this year, and look forward to reading about your running exploits on Beer Bar Band. Next Next post: Cyclists Like Beer Too….